Clicking the New Members link will bring up an empty Edit Member form allowing the entering of new members. 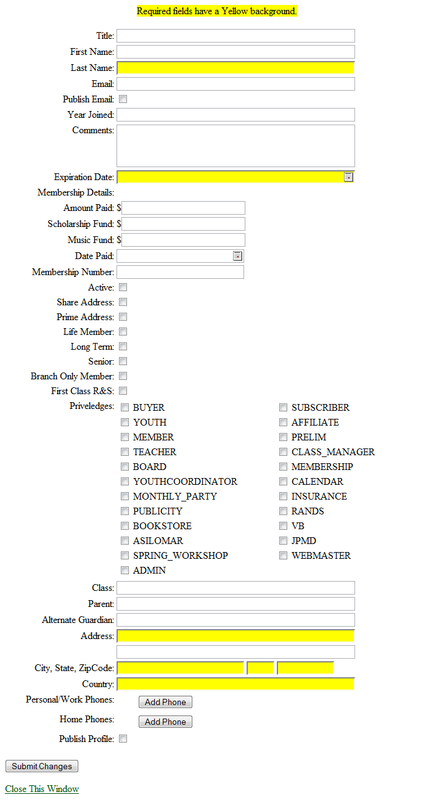 This picture illustrates the differences in the edit Profile form that is seen by different members of the branch. The above view is the most complete and is seen by members who have the privilege to create new members of the branch. 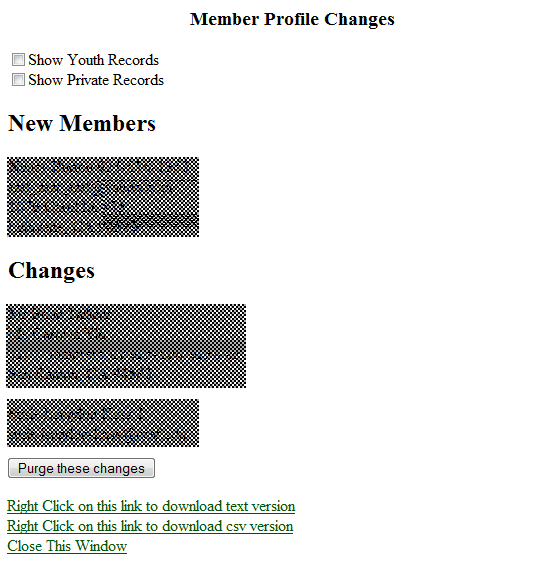 Clicking on the Member Profile Changes link will bring up the following page. This form shows directory changes since the last time the changes were purged. add Youth and Private changes to the list. Members of the branch can mark their profiles as private by clearing the Publish Profile checkbox on the Edit Member Form. The Purge these changes button will remove the change records from the database. downloading of the changes to the user’s PC. By right clicking on the link, a menu will appear. Target As’ entry will allow you to save the file to you PC. to R&S and the csv version is for importing into a database or spreadsheet. 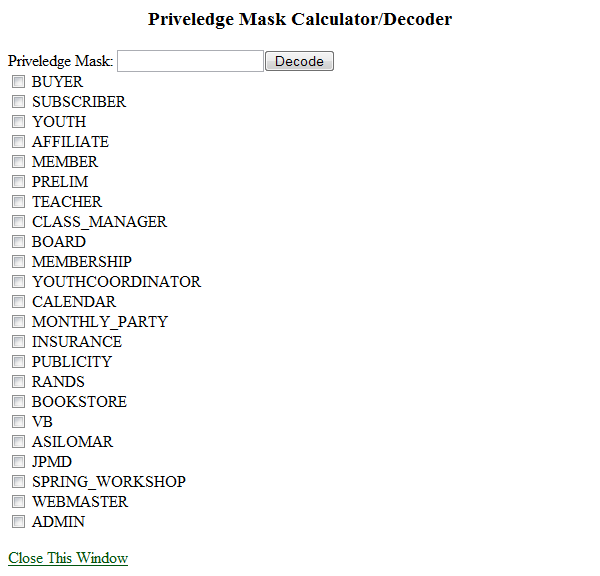 This form allows the Webmaster to analyze the privilege masks from user records to determine which privileges are set or to determine what the privilege mask should be by setting the check boxes on the form. Selecting a member from the dropdown list will generate a new password for that member and send an email with the new password to the member. Clicking the OK button will generate passwords for the new users and send email to the new users with their new password. To be selected for user creation, the member must be active, have an email address and not have a password. Clicking this link will bring up a form (that is initially empty) and update the geocode table. The geocode table is used by the Where We Live page in the Member Directory. If the geocode table is empty when this link is clicked, it could take several hours for the update to complete, but normally it should run in less the five minutes. A single lookup for the geocode information can take over a minute and there are over 100 distinct zip codes in the Bay Area that have members residing there.